Oppo which is the parent company of OnePlus and Vivo currently has the fastest mobile charging technology with its SuperVOOC Flash Charge which produces 50W at 10V/5a, Xiaomi is however about to beat that record with its upcoming fast charge which it calls the "Super Charge Turbo". The Super Charge Turbo from Xiaomi which is expected to launch today will charge at a speed of 100W at 20v/5a. Xiaomi's co-founder and president Lin Bin, posted a new video on his Weibo account comparing the new Xiaomi's 100W Super Charge Turbo on a 4000mAh battery against the Oppo R17 Pro with the 50W SuperVOOC Flash Charge on a smaller 3700mAh battery. 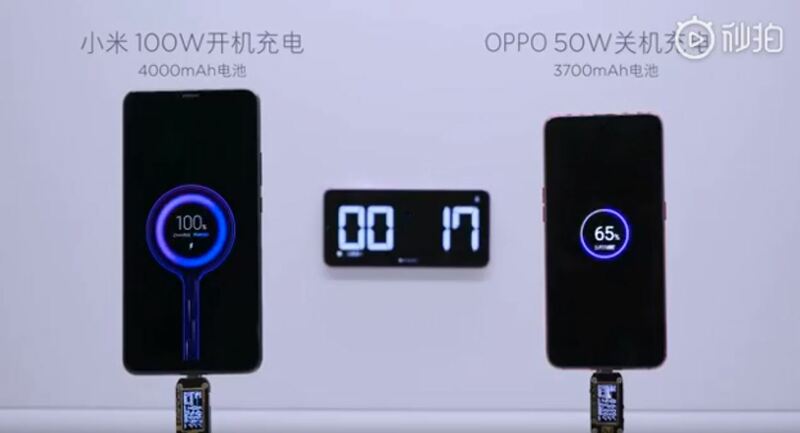 According to the video, the Xiaomi phone was able to charge the battery from 0% to 50% in just 7 minutes and from 50% to 100% in another 10 minutes which makes a total of 17minutes from 0 to 100% compared to the Oppo which did it in 35minutes which is more than two times slower. At the moment, we still don't know which of Xiaomi's upcoming smartphones will adopt this new fast charge technology, the Mi9 currently supports a 27W fast charge. The full details of the Super Charge Turbo will be officially unveiled today in China.